Kelvin Meadows is a 2011 Canadian Nuffield Scholar from Saskatchewan. His topic delved into the factors that contribute to a successful farmer owned value chain, including farmer investor relations and expectations, as well as plant capitalisation and board/management composition. For over 20 years, Kelvin was a pedigreed seed grower as well as owner/operator of a seed sales, cleaning and export business near Moose Jaw. During his farming tenure, Kelvin had the opportunity to serve ten years as Director and Chairman of the Saskatchewan Canola Development Commission, providing exposure to different aspects of the food industry. After divesting themselves of the farm in 2008, Kelvin and his wife, Shelley, moved into value added food processing through an investment in Avena Foods Inc., a Saskatchewan based gluten free oat milling plant, where Kelvin served as chair for the past nine years. The Meadows' currently own and operate a seed crop inspection business and manage the family owned land development company. Brendon Smart is owner operator and Business Development Manager of Smart Group, a 5,000- hectare property at Keith and 400-hectares at Victor Harbor in South Australia, producing irrigated and non-irrigated crops of lucerne seed, cereals, pulses, export fodder, vegetable seed and extensive livestock. The business is run by a board, with three non-family members, independent chair and part- time CEO. And has been awarded the South Australian Premiers Food and Fibre Award, Field Crops, for excellence, innovation and leadership. The business has endeavoured to be at the leading edge of technology either as innovators or early adopters. This pursuit would have been less fruitful if not for the global network of Nuffield and Brendon’s constant interaction with it. Brendon is a 1990 Nuffield Scholar, Nuffield Life Member, Past National Chairman and Chairman Nuffield International Triennial Conference held in Australia in 2011. He has a long career in agri-politics at state, national and international level, holding office for many years mainly with pasture seeds and cereals. He is Past Board Chairman of Seedmark Pty Ltd and Seedco Pty Ltd. He is Member of Adelaide University Agriculture Advisory Board, Past Chairman of Patoa Farms NZ Pty Ltd and Brimbago Asset Co.
Brendon has lectured at Macquarie University, Sydney, the Rabobank EDP Course on Agri- Business Structures and Human Resource Management, and Fellow Australian Institute of Company Directors. Brendon is married to Robyn and they have three sons. He is a keen pilot with a private pilots license, night VFR spanning 32 years. Martin Davies is a 2006 Nuffield Scholar and will become Chief Executive Officer of Westchester Group Investment Management in January 2018. Since 2014, he has been Chief Executive Officer of Westchester Group, Europe. Prior to this role he was Head of Farmland Investment at Insight Investment Management, a subsidiary of Bank of New York Mellon. Martin has 25-years' experience in farm, rural business, agricultural investment, company board and governance management. As a Nuffield Scholar, Martin studied the impact of bio fuels on UK arable farming. He has a BSc in Agriculture from the University of Reading and other professional qualifications include professional status at the Institute of Agriculture Management. Martin is also a qualified agronomist and fertiliser advisor. He was a Director of the Oxford Farming Conference from 2014-2017, and chaired the 2017 conference. Martin is a Church Council Member, enjoys sport including rugby, cricket, ski touring and running. He participated in the London Marathon in 2002 and 2003, New York Marathon in 2011 and a Marathon in Norway in 2012. Between 2012 and 2017, Martin has completed 17 Olympic and middle-distance triathlons. Jim Geltch handed over responsibility as Chief Executive Officer of Nuffield Australia Farming Scholars on 30th June 2016, a position he has held since November 2005, to take up the CEO role with Nuffield International Farming Scholars. His current remit is to expand the scholarship program beyond the current seven Nuffield countries. This will mean identifying potential investors and candidates for the program around the world as well as managing the application process, selections and international study program for the Nuffield International Scholars. A farmer and Nuffield Scholar himself, Jim simultaneously operates, with his sons, a production unit processing tomatoes in Victoria. He undertook a Nuffield Scholarship in 1986 to explore farmer education, advances in irrigation technology and computer-based crop modelling in Europe and Israel. Jim was awarded the Order of Australia for service to primary industry in the field of irrigated agriculture and promotion of agricultural research and education. Jim is married to Helen and they have four sons; Mark, Paul, Neil and David. 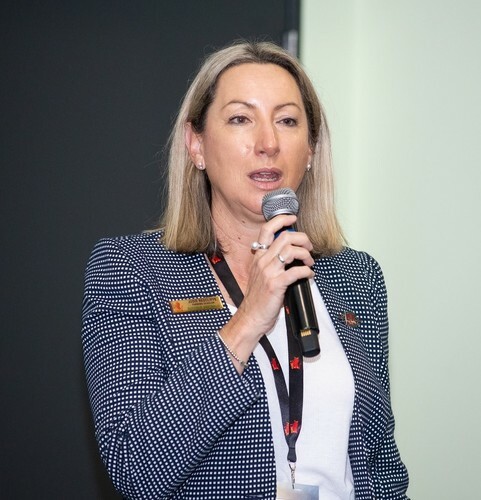 Jean Lonie was named Relationship Manager for Nuffield International in August 2018. A 2018 Nuffield Scholar from the United States, Jean earned a Ph.D. in Agricultural and Extension Education at The Pennsylvania State University, where she also served as Director of Student Recruitment and Activities for the College of Agricultural Sciences. Her dissertation, "Exploring the Public Value of Nuffield International Farming Scholars Program," investigated how Nuffield Scholars perceive their experience in the program in terms of contributing to public value and having significance beyond the individual participant. Her professional background includes marketing and communications efforts for Farm Journal Media, the U.S. Holstein Association, the School District of Philadelphia, and American Mushroom Institute. In addition she was director of communications for the Pennsylvania Department of Agriculture. Active with the Nuffield program since 2010 when she helped coordinate the Contemporary Scholars Conference (CSC) hosted in the United States, Jean served as a delegate in 2012 and helped facilitate CSCs from 2013 through 2017. In addition, Jean is an alum of the Pennsylvania Rural Leadership Program.